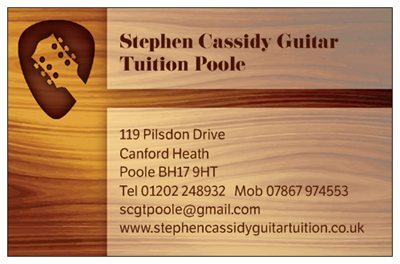 " I have been having regular guitar tuition from Steve for over a year now and the lessons have been very enjoyable. The first lessons gave me a motivating introduction to electric guitar and alongside progression through the songs in the Rockschool books, techniques and variations were also explained. The lessons have been brilliant and I would recommend Steve Cassidy to anyone of any age." "I wanted to learn how to play the electric guitar as I couldn't play a note. I called Steve Cassidy and started lessons, I have had about 6 to date. The lessons are at his studio and we initially have some practice and then go through some songs. I have to admit that I really enjoy both the lessons and having the ability to read and play some music, albeit at grade 1 level. Steve has a calm teaching style and his methods are certainly helping. Thanks Steve"
"I have been having lessons from Steve learning to play the Electric Guitar for about three years now. He has taught me from a complete beginner . I am now learning my music pieces for my grade 5 exam. I even managed to play at my own 40th birthday party with the band I had arranged. Yes you are never to old to learn. He makes the lessons enjoyable, informative and all in a relaxed atmosphere. A most enjoyable experience. Thank you Steve." "I have been learning Guitar with Steve for eighteen months now and have learned so much already. - Very good teacher and easy going." "Steve is an inspiration! I go along to my lesson feeling like giving up and come away knowing that I can play if I just put my mind to it and practice. - Aged 60 plus!"